I can't believe I go back to school in less than one week! Where has the summer gone? 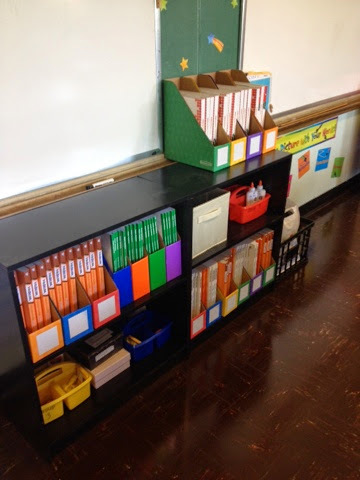 I always love back to school time and find it exciting and refreshing to start each year new. 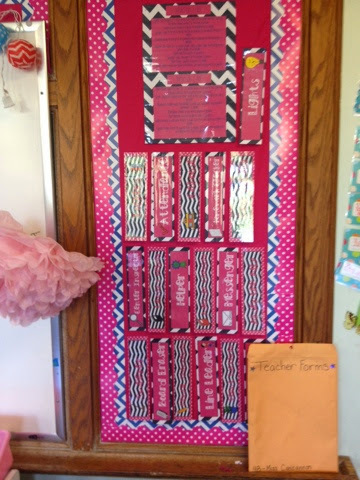 This year I decided to redo my bulletin board backgrounds and changed my theme. I decided upon pink polka dot and navy chevron! Here is a picture of my job bulletin board. It looks busy, but I have two really small boards and had to fit a lot onto each one. 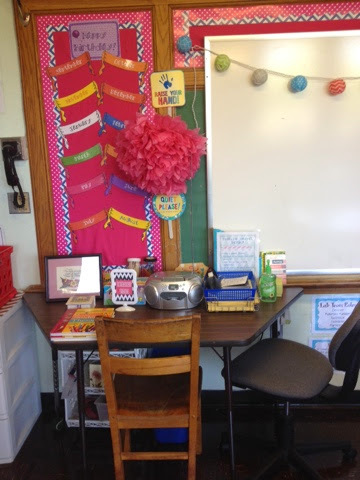 This is my listening station and writing center with the birthday bulletin board. I need to add the student names. I bought adorable cake cut-outs from Target to write them on. I am also obsessed with my paper lanterns from Mardel! 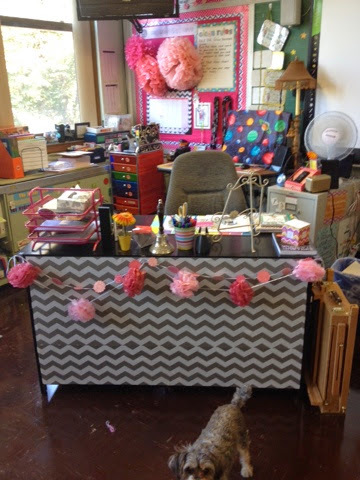 I have tables instead of desks in my room and decided to fit the kids at four tables this year. This leaves me open to use the fifth as a small group/teacher table. Each table has a number that I put in these cute frames from Michaels. 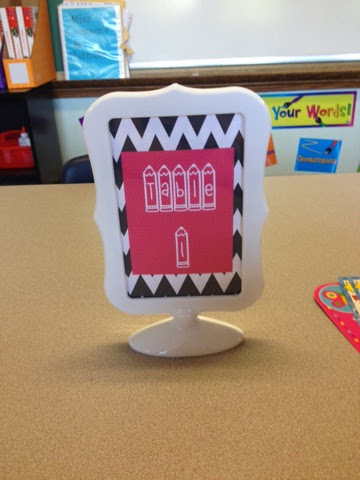 I made the desk plates and they are available on my TPT store. I am in LOVE with my library this year. 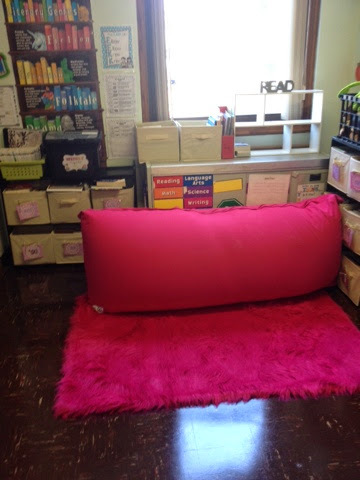 I had a very generous parent donate two Yogibo bean bags at the end of the year. They are the most comfortable seats ever! I still have my fabric bins with each library book leveled. 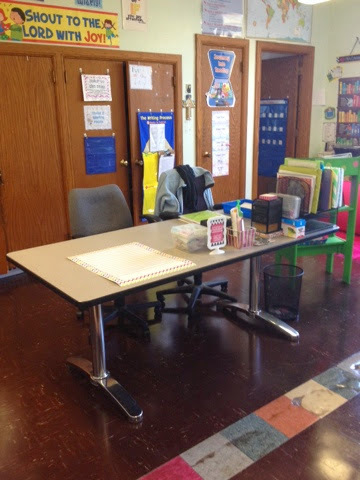 The last area in my classroom is the teacher desk area. I am definitely not loving this area yet...it's really cluttered and visually overwhelming, but this doesn't need to be completed right away. It's a work in progress. Say hi to my puppy Maggie who snuck her way into this picture :) She's a really good assistant!